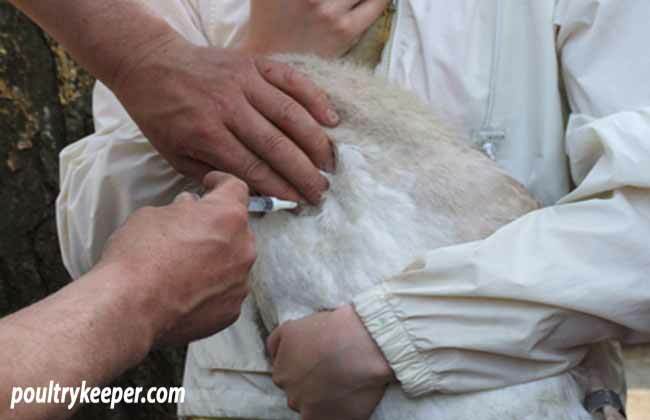 Summer 2006 and our 23 geese and 4 chickens are vaccinated….at last. It could have been done sooner, but we wanted the goslings to be vaccinated as well. We were told that according to the European Union we had to wait until 1st July, when our goslings were old enough. They had to be seven weeks of age before they were allowed to be vaccinated. As things were so insecure, due to the AI threat, we thought it would be better not to breed this year. We were sorry to disappoint a family who had ordered two geese the previous year. When another family called looking for two geese, vaccinated, we decided to breed a few goslings. We told the people who had ordered last year that we would breed our geese and that we would vaccinate the goslings. That meant that they had to be registered by the Dutch Ministry of Agriculture if they wanted geese from us. They agreed. On Friday, June 9th, Sible Westendorp, the veterinarian and chairman of the NWPP (Dutch workforce for poultry and waterfowl) came over. Vaccinating them all on one visit would save us the cost of a second visit. I’ve been waiting and fighting for three years for this moment since the outbreak of Avian Influenza H7N7 back in 2003, but that Friday morning I was very nervous. Had I made the right decision? How would the birds react on the vaccine? Could I persuade the vet not to put on those awful metal leg bands? (The official identification for vaccinated birds) And more of that. It almost gave me a stomach ache…. Unfortunately, Sible didn’t dare not to put on the metal leg bands. He didn’t like them either but we had no choice at this moment, he told me. With four of us working, the job was done in less than an hour. Peter, my husband, took some pictures and Marieke and I picked up the birds. We had shut them up in their night houses, so they were easy to pick up. They are very tame and used to being picked up. Bernadette, Marieke’s mother, made sure no others would get out and closed the door behind us when we got one out. First Sible had to take blood samples. As some friends had scared me that it would become a bloody mess to take blood samples from the geese, I asked Sible if it was okay to take blood samples from the chickens. “The customer may choose,” he said with a big smile. He took blood samples from two chickens. The required minimum is 5% of the complete flock but at least 2 birds. Normally they cut a vein in the wing but as Sible saw my face he asked, “Shall I try it with an injection needle?” “Please do,” I told him. 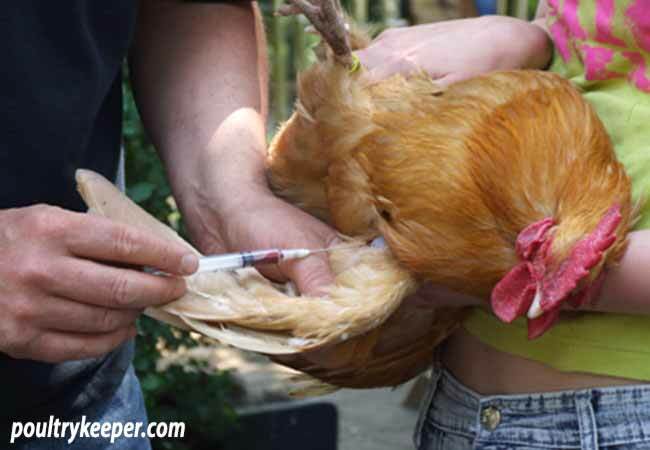 It didn’t go as I had hoped, because the chickens got scared and moved while he tried to get the needle into the vein, so they started bleeding. He got enough blood, and I really was glad we hadn’t done that with the geese. After the blood samples were taken, the birds received their metal leg bands, marked Vaccination AI 2006NL (NL = The Netherlands). Then they got the injection in the breast muscle. They didn’t give a single kick. 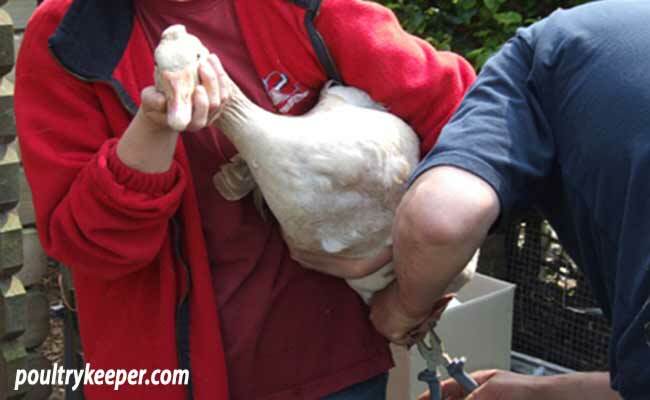 After the chickens were vaccinated, we took the geese: first the leg band, then the injection. Not a single one was difficult, not even the goslings. It had to be done with a pencil, not just print the forms. As it is a pilot project, I suppose, it takes time. Same as those awful leg bands. Poor birds. Now they have on each leg a leg band and the metal one is quite heavy. They already had a plastic leg band with a unique number on it. Really, we are very curious how they will do that next year. If we vaccinate again next year, will they need a 2007 leg band? The metal leg bands are so difficult to remove. It takes three people: one to pick up the bird, another to keep the leg still and the third one to remove the leg band with special equipment. I can’t imagine our government wants to add extra leg bands each year, filling up the leg with leg bands! I really do believe the people who work at our Ministry of Agriculture have never seen a goose or chicken alive, or they wouldn’t have agreed on such awful leg bands. I wonder if they have ever seen such a leg band at our Ministry. Maybe some vet of the Animal Health Commission came up with them. Oh…they are just birds, they must have thought. Animal welfare is very far away. If they really had no other choice than those metal leg bands, they should have given them a unique number so they won’t have to be replaced if we continue the vaccination program. Better yet, they should listen to the NWPP, who had other suggestions for identification. You do wonder why our own Ministry chose those leg bands, not the EU. The reason they need to be identified is for our AID (Animal Health Inspection), so that the inspectors can see from a distance which birds are vaccinated during a period of confining. Vaccinated birds no longer have to be confined. Suppose our birds are in their pools when they come over and we’re not at home. No one can see if they wear a metal leg band. Sible suggested that since we live in a century of modern technologies, why don’t they have a laptop with them with all the information on it? 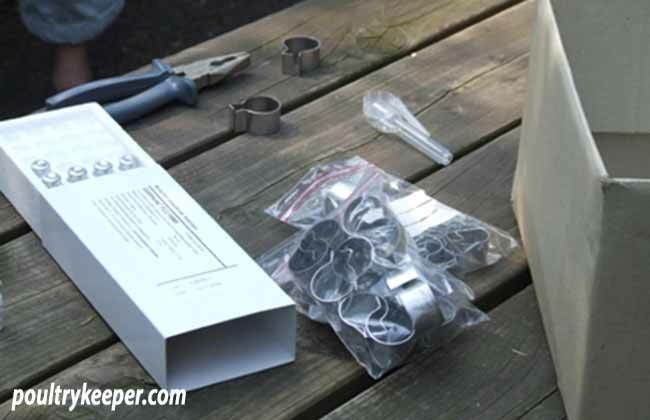 Just fill in an address and they will know if the birds are vaccinated or not. Or don’t they trust us? Would we buy new birds that aren’t vaccinated and might not be confined? That may be a reason. I do hope all of the world will get the opportunity to protect their birds against Avian Influenza H5N1 like us and France, as experts say we won’t be rid of it for the next 50 years. Right now, a day later, I’m very glad we have vaccinated our birds. Nor only will it protect them against this nasty virus but also, we won’t have to confine them again next autumn (and maybe all winter). I really think it’s the keeper’s responsibility to vaccinate or not. We should have the choice, not need permission from our governments! Our geese are fine, not a single vaccination reaction and doing as usual. They only thing that is different is if they hit something with their metal leg band it goes….cling cling. It took us a few hours before we knew where that sound was coming from. On June 30th they will get their second injection so they will be protected for a year against H5N1. Then between nine weeks after the second vaccination and a year, more blood samples have to be taken. They want to have a lot of these test results so our Ministry, and the EU, can get more information about vaccinating birds against Avian Influenza. We are a pilot program, the same as France. If it will help to get all the birds and humans protected against H5N1, I don’t mind.